For a while, I went down to the Compact Size, which has the same page height and 6-ring layout as Filofax's Personal size, but a greater page width. It's an interesting size, proportioned more like an A5 sheet, but more portable. If the Personal's narrow page makes you feel cramped, you might like Franklin's Compact better. Franklin's also comes in bigger ring sizes than Filofax offers, which lets you carry many more pages! Of course, these factors also make the Compact less portable than the Personal. I can toss the Personal into almost any bag I own, and not feel it's cumbersome. Carrying a Compact, although it's smaller than an A5, still feels like carrying a "big book" to me. Closed, it measures 6.25" (16 cm) wide, 7.5" (19 cm) tall, and it has 1.25" (inside diameter) rings. I think I spent less time with the Compact than any other model or size because of this worst-of-both-worlds feeling it gave me. But I did—and still do—love this binder. Nice forest green leather (green's a hard color to find), and it feels and smells great. You can't see it in the picture, but it has the Franklin Quest imprint—from before the acquisition of Stephen Covey's productivity training business. Oh, my! Take a look at the conversation we've got going on the previous post! Click if you've always wanted to know how to convert a single pen loop into 2 pens loops with a single snip! Do you remember Filofax refills on onion skin paper? 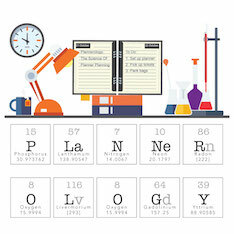 What previous planners do you wax sentimental about? We've been talking about our Franklin Covey experiences lately, so I decided to dig up my old FC planners. I have three: two Classic (7-ring, half-letter size; similar in size to A5) and one Compact (same ring configuration as Filofax Personal, but with wider pages). My first Classic Franklin Covey planner is still my favorite, and the only one of the three I'm going to save in the long run. It's all leather, and I bought it because of its small "footprint." Instead of being larger than the pages, the planner's zipper hugs them. It's barely bigger than the pages themselves, and also has a slim ring size. It's more suited to a weekly than a daily page format. I'll take pictures of it soon, but today I'm starting with the last planner I was using before, in 2000, I switched full-time to a Palm Pilot. Actually, the full transition took about a year. When I finally abandoned this beautiful fabric and leather planner with its one-and-a-half-inch rings, it weighed three pounds and contained all of the notes I needed for my 4 part-time/freelance jobs and one volunteer job, as well as all my personal stuff: home repair and car records, Christmas card lists, wish lists, and so on. I even found a list of all NFL teams and their towns, and a list of poker hands in winning order. Hey, you never know when you're going to need that stuff! Imagine going from carrying 3 pounds of leather and paper wherever I went to a Palm Pilot! But I did it. I found this planner in the basement in virtually the same condition it was in when I stopped using it. It's like a snapshot of my life, frozen in time. I'm fascinated by the number and variety of pages FranklinCovey supplied, including about 20 pages of instructions on using the planner itself! I'll scan some of these forms one of these days, since it's hard to take clear photographs of them. There are a bunch of pictures on Flickr of some of the forms and how I used them. FranklinCovey still makes a lot of forms, but not nearly as many as they used to. They sell software for printing out the additional forms yourself. Any Franklin Quest or FranklinCovey refugees out there? 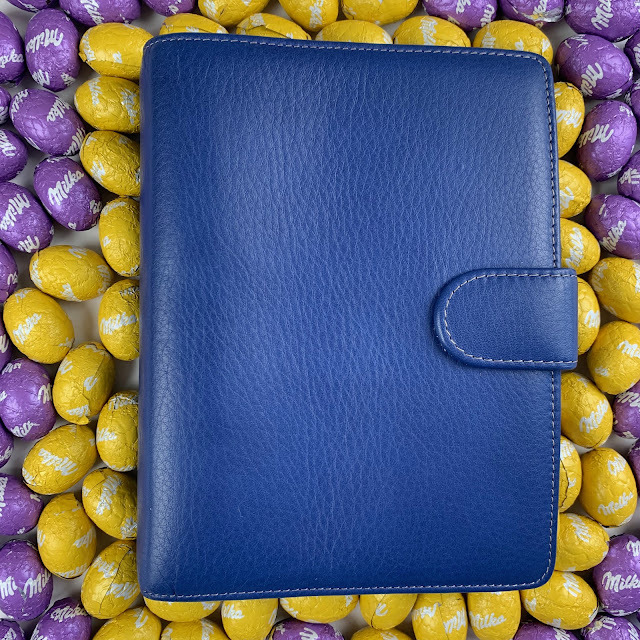 Are you marking the change of seasons in your Filofax? Does 12 posts make a tradition...our tradition of open Friday threads. We're pleased to present the following book review from our reader Vidya. Thank you for sharing this with us, Vidya! I stumbled upon this book on Amazon Marketplace. Originally published in 1987, this is a compilation of users’ tips and insights along with some fun stories of bullet proof planners and planners used as conversation starters. I can’t say I learned anything earth shattering, but I did get some good tips that I’ve started using such as the Yearly Event Reminder and priority codes. 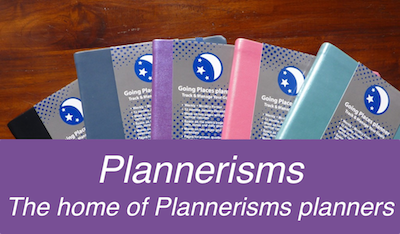 But for me, the best part was reading how other planner-geeks use some of the same strategies I get a lot of value from—I found myself furiously nodding in agreement as I leafed through the book. There are lots of copies available on Amazon Marketplace. I found it to be a great value and an addition to my collection—if nothing else it has allowed me to wallow in planner love. I will definitely consult it when I feel my system starts running off the rails. Filofax's To Do pages are like no other. A nice wide space with room for one or two lines of writing—you can fit a lot of words in there if you write small. A simple checkbox to tick off completed items. And the most ingenious part - a subject box at the top. - I always write the year in the upper-right corner, for filing purposes. If a project or topic continues, I try to remember to start a new page for the new year. - Using a ruler and black pen, I draw a line about a centimeter or 1/2" to the left of the checkbox, creating a new column. For items that have a clear due date, I write the date in this column. - In the subject box, I write the name of the project, usually a book I'm editing. These pages go behind that book's tab. I also have a section simply labeled To Do for Admin task lists and projects too small to have their own tab. - Every morning, I go through my email inbox and master checklists and write down tasks for everything I have to do. I don't even worry about due dates until later. I find it really helps to have everything written down, even the small stuff, making my To Do lists completely reliable when my brain isn't. - When someone else has to do something, or something has to happen before I can act, I write that down in red. My own tasks are in blue. Using 2 different colors lets me focus on my own responsibilities. The due date column works great for "waiting-fors," since they help me keep other team members on track. In my Personal Filofax, I also draw the lines, and I use these pages to list Web sites I want to visit, calls to make, errands to run, and maybe-dos, again labeling the page accordingly in the subject box. Listing Web sites I want to visit and things I want to look up on Wikipedia helps me get these distractions out of the way and get back to work! Most of the time, actually reading the stuff that was distracting me is anti-climactic. Feels good to be back in the old routine, doesn't it? Have you changed planners or sizes for autumn? I'm sorry for making you worry about me. I'm fine! I've just been thinking about what I want to do with this blog. I didn't want to come back without a plan. I find that the fall is a better time for me to make fresh starts and resolutions than January. I think it's a combination of the academic year that I grew up with, and the fact that the change of weather from the humid dog days of August to crisp, sunny September feels more like a new year than January's nondescript dead of winter. Let me start by thanking all of you for your recent great posts on Free for All Friday No. 10. It's much more activity than I deserve with my recent absence. Your systems and ideas are truly inspirational!! I mean that to every single one of you. One commenter, Joffrey CA, raised the issue of my real identity. Yes, you've figured it out. I work for O'Reilly Media, and my name is Nan Barber. I didn't go to any great lengths to hide my identity, since I have no compelling reason to. I was mainly concerned about what my family and coworkers would think, and it turns out that none of them have any interest in the fact that I'm doing this blog. 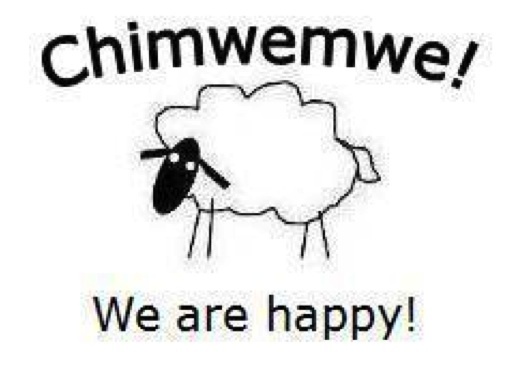 - The blog will not be personality-based; hence, my use of a pseudonym. - Good writing and constructive comments will be top priority. I'm proud to say during my tenure (going back to 2006) I've only had to delete one nasty comment. - I'm up to a 4 Filo life: An A5 for work, another A5 for the kitchen counter, a Personal, and a Pocket for fitness records. I bought a 2008-09 academic year week-per-2-pages for this Filo. - The A5 for work is working better than ever (finally, after 2 years!). So I've bought a metal A5 punch, and plan to get a ream of A5 paper and create my own pages. - I'm loving the Pocket size again, and considering eliminating the Personal. Something about those 3 x 5 inch pages feels so good. Thanks again for all your support, and for drawing me back!